Buttons give a garment personality. A good button is like jewellery, it adds interest and distinction. We enjoy the natural variation and irregularities that natural materials provide, and the interest and distinction natural buttons add to garments. So we use shell, horn, metal and thread buttons wherever possible. We ensure that all buttons used are machine washable, for this reason, we don’t use or leather buttons, and we use wood buttons only on our silk shirt that requires gentle washing. The buttonhole is thought to have been brought to Europe from the Middle East by knights returning from the Crusades. 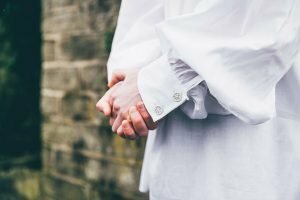 Buttons became a staple of men’s fashion from 13th to 18th century, when jackets could feature rows of buttons from chin to waist, and sleeves too could be buttoned from elbow to wrist. Button making thrived all over Europe and by the late 18th century buttons started being mass produced in factories – in steel, glass and even china. By the early 20th century buttons had become less of feature as clothing became more sedate. Plastic buttons – In 1930 that cheap plastic buttons first became available, and by the end of World War ll most of the clothing industry had abandoned natural materials in favour of plastic or polyester buttons. Horn buttons are made from the antlers of male deer, shed naturally by the animal each year. Antlers grow faster than any other mammal bone. In the past antler horn was used for many purposes including making tool such as pickaxes, combs, handles for knives in addition to small items such as toggles and buttons. Our dark horn buttons come from India – we use them on our cotton chambray shirt. Metal buttons are long associated with military uniforms and have been commercially produced for over 200 years. Like the cap badge, buttons were part of the military insignia, silver or gilt buttons on a scarlet soldier’s tunic was part of the glamour of the military. When we find a good metal button we use them on our waistcoats. Pewter is an alloy of zinc and tin. It was used in the ancient world by the Egyptians and later the Romans, and came into extensive use in Europe from the Middle Ages where it was much used for tableware from 13th to the 19th centuries when pottery and glass largely replaced it. Pewter is still used for small decorative objects such as buttons, just as it was 200 years ago. Our pewter shank buttons are centrifugally cast in Nottingham by a family business. They are largely used by re-enactors. We hand stitch these onto our black moleskin waistcoat – available on other waistcoats to order. The iridescent mother of pearl, or nacre, that lines the inside of mollusc seashells provides a very strong material, and is made up of microscopic calcium carbonate tiles. Buttons have been made out of seashells for over 5000 years – the button would be cut and pierced to stitch it on, both as a fastening and decorative feature on the garment. The colour of the shell varies from a silvery white that we all recognise as “mother of pearl” to a whole range of iridescent colours. Commercial shell buttons today are machine cut and drilled so we can attach by sewing machine, however natural shell button are all different – the irregularity of a natural material is part of its charm. We use white pearl buttons on our nightshirts. In the 17th and 18th century when commercial buttons were not readily available, people made their own thread buttons by wrapping linen thread around a thin disc of sheep’s horn or a metal ring. Buttony became an established cottage industry in Dorset from the mid 17th century until it faded in the mid-19th century, when machine made buttons became cheaply available. The trade was organised by agents, who sold the buttons around the country. Various styles evolved, including the Blandford Cartwheel design, which we make using cotton thread on a metal ring, and attach by hand.